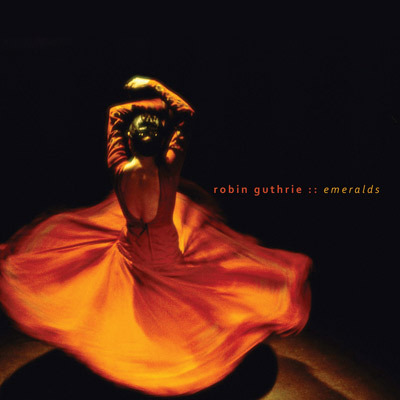 I am trying to find the right description to the ten tracks that were created by Robin Guthrie, who carries long and varied history behind him. The music sounds naïve at first, but I will be stupid to think this warm music is indeed naïve. The tracks, some comforting, some exciting, were all created by proficient hands and a vision that has seen a lot already. No, this all constellation of majestic composition isn’t naïve at all, it us who sometimes mistake aesthetic persistence and beauty to be naïve. Instead, I think that Guthrie is showing his audience a lush, endless world, springing to existence like a glorious, shiny prince, so different from the gray waste of modern life that it makes it hard for words to describe its features. Guthrie’s music is always embracing and touching, if it’s on the gentle “digging for Gold”, which reminds me the charming moment on one of the best Sigur Ros songs, or on “The Blue Book”, which builds up to an explosion of Post rock guitars and intense emotional drive. Be the case as it may, Guthrie holds this construct of an aesthetic, rich world, in front of the listeners, surrounding them with heavenly music and drawing strong nostalgic notions to his creation of detached time and space. With “The Little Light Fades”, Emralds end in a soft swansong, as magical as the opening for this album was. You will find the music of “Emeralds” to be the right kind of warm serenity to be delivered by careful, understanding and professional hands, so in effect, when Guthrie shows me goodness, I believe him.